These are smaller roles for the AU Animation project Ace Attorney the spirit of justice. These rolls will not be as pertinent as others. He's kind of a cruel and sinister person. He abuses the law to his own discretion. However he is calm, composed, polite. He always is courteous and manages to keep a straight face. He can come off as a personable person when he tries! However, he can be downright creepy and threatening when he needs to. 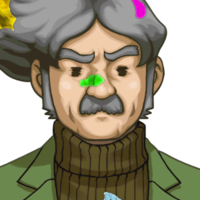 Quite the pair of prodigies you've managed to pick up, eh Wright? I'm sure they are promising students. A test of wits, a silent clash of passion. Only the cards, their backs wreathed in blue flame, know its final outcome. 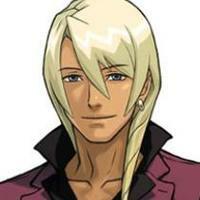 Klavier Gavin is a veteran prosecutor and he is the younger brother of, Kristoph Gavin. He was also the lead vocalist and guitarist of his own rock band, the Gavinners, before they disbanded so he could continue practicing law full time. 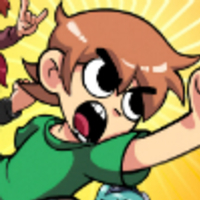 Super peppy, super exciteable. He's a rockstar! You can never have too many guitars...they are like....my lovers. Actung, baby! Today, we play it my way! Drew Misham was a picture book illustrator who sold forged paintings on the black market, made by his daughter, Vera. 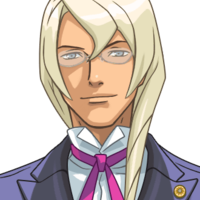 He later is prompted by Kristoph to forge evidence for him to win cases / control the legal system. A soft spoken old man. He does what he has to, to give his daughter a good life. Most of my clients prefer to remain anonymous, even to me. I make the items they want, and receive my payment. That's the extent of my contact with them. Oh, yeah. I mean... I made it. You might call it one of my "works". ..Don't look at me with those eyes. I know that it is that I do. More than half of the paintings they bring me are stolen. Daughter of Drew Misham, and an excellent painter. 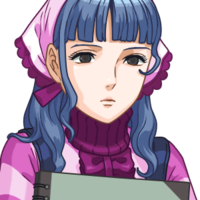 She is employed by her father to create forged paintings to sell on the black market, as well as forging written / chemical evidence. She is very quiet and shy, and often prefers communicating through drawings over speaking. I created things, and Father sold them... The closer they were, the happier Father was... I was happy, too. Yes... I did it... For Father. I know... it was wrong. I... don't go outside much. I like to paint in here. Various bailiffs / officers that appear now and then. Minor reocurring roles. Defense, the court room proceedings are about to begin! Please proceed to the court room! Ms.Von Karma! Ms.Von Karma! We have the forensics results back!